Every business should have a clear understanding on their operating costs and should be constantly evaluating this spend regardless of size or how big your company is. What does it mean to be evaluating your spend? If you asked your accounting department to provide a list of the top 20% of vendors in relation to how much money you spend with them annually, this would be a start. 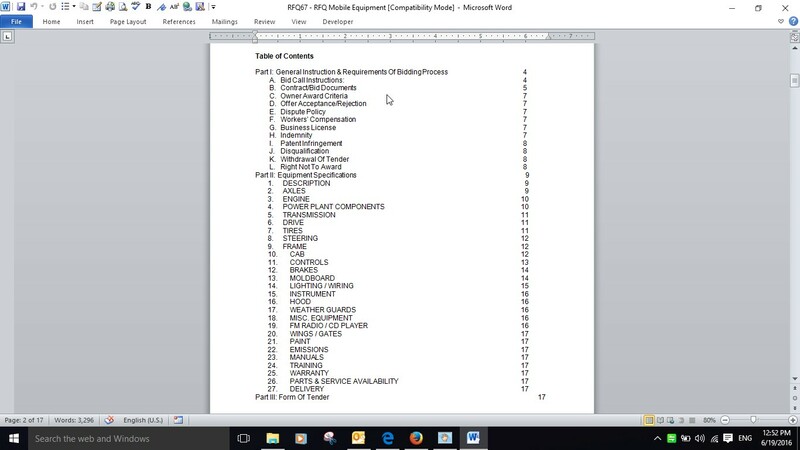 This list of suppliers will represent close to 80% of your operating budget. I know, the pareto principle is overused but in this instance is 100% on point. Prudent business owners will dedicate a large portion of their time or their purchasing department’s time on analyzing this 80% cost. These are your target vendors and where you need to focus your efforts. Requesting price concessions for your guaranteed or long term business and suggesting that they partner with you on productivity improvements are two quick solutions you can key in on. 1. First drill down and gather specific details on this spend. How many widgets am I buying of a specific product in a 12 month period? This is known as your annual usage. What is our cost to procure these items? Is there a better quality product which will perform the same function and reduce operating costs? Are there like vendors that can provide a similar material or service? 2. Approach your existing vendor directly or by way of a RFQ and request firm pricing for a 12 or 24 month period. In exchange for this commitment, you are expecting preferred pricing. This does two things, stabilizes your costs for the next 12 – 24 months and reduces ordering costs as these commodities can be covered by a contract or supply agreement. 3. Creating competition is the best way to achieve fair market pricing for goods and services. To achieve this, you need to issue a Request for Quotation (RFQ) for the above item(s). If your spend warrants, you should do your homework and pre-qualify vendors for these items. Ensure they are of similar quality by asking for samples and get a sense whether these suppliers can meet price and delivery timelines based on your usage or existing requirements. No use buying something for 10% less than what you are presently paying if the new vendor cannot deliver! 4. It gives the vendor comfort knowing they have your business for the next 12 months in exchange for better pricing. By granting them a contract for the next year, the expectation is the vendor would guarantee they carry relevant inventory in their local branch which would then allow you to reduce on-hand inventory. In this instance you are reducing carrying cost, cash outlay for inventory and achieving a reduction in unit costs. Savings all the way around! Issuing a RFQ (Request for Quote) to determine present market pricing is always the preferred way of doing business. It is ethical, transparent and begins to condition your suppliers of your intention on monitoring your spend. It sends the message that your company is focused on ensuring you are receiving the best possible product at the best possible price. If creating a RFQ to help manage costs is on your radar, there are many sample RFQ templates available on-line or the team at RFQPro would love to help you get the ball rolling. Here is to your success — Mark. 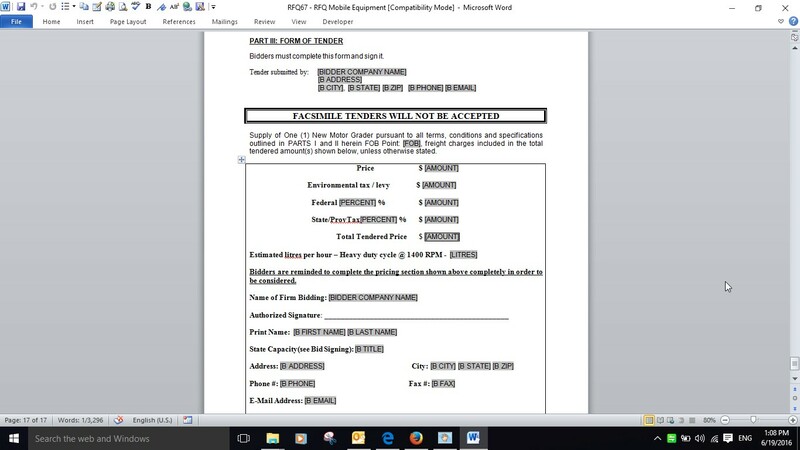 RFQPro template #24 is a 13 page sample request for quote for Telecommunications. When issuing a RFQ of this nature it is going to be much more technical than the average proposal you would issue. In fact, it is all about the specifications so having a third party expert to consult or provide the technical component should be strongly considered. After meeting with all the parties in your organization they would be able to provide a solution which will meet with all the departments and overall companies needs. Keeping this in mind, this template will provide you with a strong sense of what is needed to issue a quotation for a new telecommunications system. It provides details on Evaluation Criteria, Bid Instructions, RFQ Addenda details, Warranty verbiage, General Terms and Conditions as well as many other standard terms you would typically use. For the Technical component there is a sample specification which covers installation, system specifications, system requirements, physical characteristics, cabling, VoIP, performance specifications, basic phone features, call processing, warranty and maintenance so much can be gleaned by using this template to help you kick start the process. Not all organizations would have in-house expertise available to assist in crafting a RFQ of this nature so stick to your strengths and ask for direction where needed. 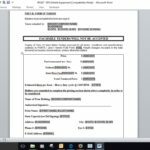 Let RFQPro.com help – this RFQ Sample for Telecommunications is included in our Premium Pack (90 plus templates) and in the Mega Pack. If you are looking for a detailed RFQ – Request for Quote for the purchase of a piece of mobile equipment and you are in the public purchasing field, this sample RFQ template will expedite the tendering process. This one specifically addresses the acquisition of mobile equipment (Road Grader) but can be used for any major piece of equipment by adding your own equipment specifications, sometimes you can download these specification online directly from the manufacturer. RFQ67 – Mobile Equipment template is 24 pages and includes a layout you can use to add detailed equipment specifications. Here is a quick look at a few pages of this template. RFQ67 template is available in our premium pack offer. Template #RFQ37 can be used for publishing a standard or simple RFQ. Valuations and risk to the bidder do determine complexity of the request for quote document you issue. The lower the risk and dollar value, the less complex the document might be. The point — if you are procuring stationary or photocopy paper say versus an oil filled electrical transformer. For the copy paper, a standard RFQ | RFP like RFQ37, would likely suffice. In the case of the transformer, you would be wise to provide a more detailed request for quotation document to ensure you have all your bases covered. If you are unsure, it is always a good idea to have legal counsel approve your RFQ before it is issued. 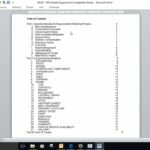 You will find this Microsoft Word edit friendly RFQ template and 44 others in our Standard Pack. Click Here to sneak a preview of this 3 page document.